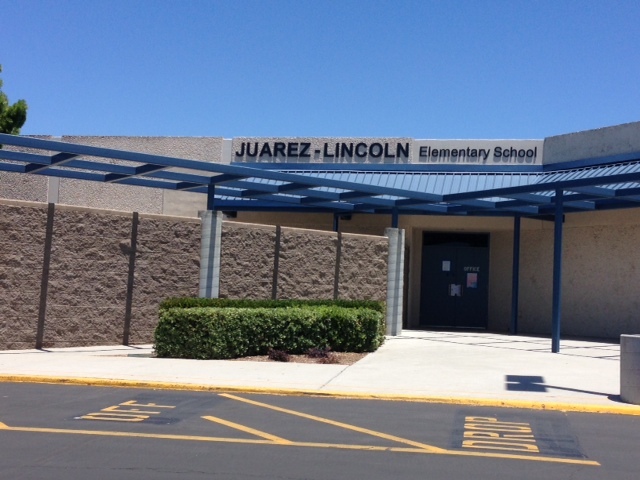 Juarez-Lincoln, a K-6 elementary school located three miles from the international border with Mexico, is a single-track year round school on Otay Mesa in South San Diego. The school was built in 1971 and is a part of the Chula Vista Elementary School District. During the summer of 2000 Juarez-Lincoln was modernized and added 16 additional classrooms as well as the infrastructure to support technology access from all locations in the building. The grounds and buildings have been transformed into a 21st Century learning environment and a significant resource for the community. enrichment activities. Monthly Family Education Nights invite the entire family to participate in technology, literacy, science, and mathematics activities to support the value of life-long learning. The teaching staff includes 12 primary, 9 upper grade, three Special Day Class, 1 Resource Specialist, 1 Speech and Language Specialist and 3.5 days of school Psychologist time per week. The full day Kindergarten was initiated during the 05-06 school year after 5 years as an extended day program for kindergarten students. During the 2014-15 school year, the school transitioned from an Alternative Bilingual Model to Sheltered English Immersion program model. Support Staff: Additional support staff includes the school nurse, secretary, attendance secretary/health specialist, full time English Learner Instructional Assistant, Kidco Specialist, one part-time library clerk, 8 Special Ed Instructional Assistants, 2 Literacy Instructional Assistants, 4 cafeteria staff, 6 noon supervisors and 2 full time custodians. Additional Programs: The school library is open 20 hours per week. There are two State Pre-School programs on site in addition to the Mommie and Me pre-kindergarten program. The YMCA supervises the 21st Century STRETCH program, which is a free before and after school childcare program that serves over 100 Juarez-Lincoln students. Students receive supervision for homework, arts, sports and character development through this program. National School Lunch Program-Free and Reduced Lunch: 75%. All students are eligible for a free breakfast and lunch each day. 56% of our students are classified as English Language Learners. Staff provides daily structured English Language Development instruction centered on the English Language Development (ELD) Standards. Additionally, ELL students are taught English instructional skills through a variety of Specially Designed Academic Instruction in English (SDAIE), and GLAD (Guided Language Acquisition Design) strategies to ensure academic learning while students are becoming more fluent in English. ELL students also utilize the software program Imagine Learning English for a minimum of 100 minutes per week. The Instructional Leadership Team (ILT) helps drive the instructional focus and professional development to continue supporting our ongoing work to improve student achievement at Juarez-Lincoln School. The team is made up of classroom teachers and the principal. The ILT meets twice per month afterschool. Juarez-Lincoln Elementary is fully implementing the California State Standards. Therefore, our professional development is centered around understanding the standards, instructional shifts related to increased rigor, and best practices that align with each standard. The Technology Team, comprised of teachers, meets regularly afterschool to plan and present technology inservices to staff. The Tech Team also maintains and updates the school’s 80 Mac Mini’s, 20 iPads, 125 iPad Minis, teacher MacBook Pros, and 93 Asus tablets. Parent Engagement: The engagement of parents in supporting student achievement is vital to a school’s success. We have established programs that encourage parent involvement and participation school wide. Parents participate on committees such as the SSC (School Site Council), ELAC (English Learner Advisory Council), PTA (Parent, Teacher, Association), GATE (Gifted and Talented Education). Parents are highly-encouraged to volunteer in classrooms and on the playground.